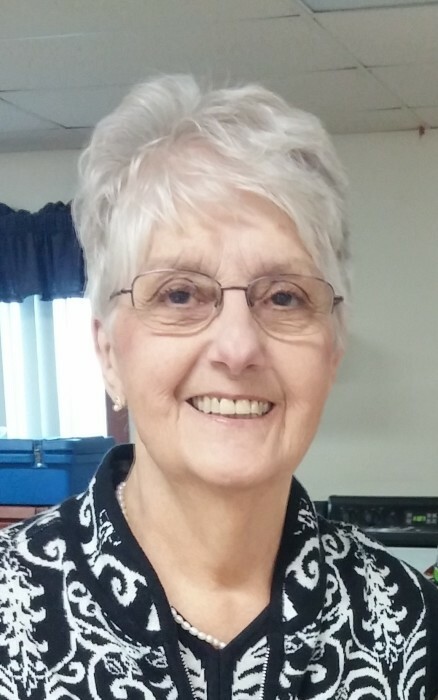 Accepting God’s will, Joan Loretta Hartley, 81, of Seneca, passed peacefully on Friday November 16, 2018 in Viroqua, WI, surrounded by her family. Joan was born November 12, 1937 in Eastman, WI to William and Loretta (Boylen) Martin. She married Floyd F. Sutton on June 6, 1959 at St. Wenceslaus Catholic Church in Eastman. He preceded her in death on August 27, 1990. She later married Joseph Hartley on August 16, 1996 at St. Patrick’s Catholic Church in Seneca. He preceded her in death on May 7, 2014. Joan was dedicated to public service. She was an educator, teaching in one room schoolhouses and assisting in the Seneca Public Schools for many years. She was a devoted wife, mother, grandmother, and great-grandmother, selfless with love and a strong example of living the Catholic faith. Family and faith came first and she took comfort in the promise of eternal life. She was dedicated to her community and an avid volunteer for her church, school, and organizations, working as a poll worker for many years. Her creativity was expressed through sewing, be it through sewing clothes for her children or quilts for her grandchildren. Her ten years at the Prairie du Chien Wal-Mart provided many opportunities for crafts and creativity. Joan was gracious in all blessings received and kind to all she encountered. She loved a bargain and a good book. She created many traditions in her family that they will treasure and carry with them always. She travelled far and wide, from Ireland to Rome, making friends wherever she went. She drove us all to be our very best selves. Joan was always there to offer a patient, listening ear and strong shoulder to rest on. She showed perseverance through the toughest times and showed amazing grace until the very end. She leaves behind a legacy of abundant love, unending courage, and extraordinary faith. She is survived by her children, Floyd (Kim) Sutton of Freeport, IL, Jim (Lisa) Sutton of Fond du Lac, WI, Dianne (David) Isnard and Sharon Engel both of Waukesha, WI, Marjorie (James) Anderson of Bangor, WI, Greg (Amy) Sutton of Onalaska, WI, Kathryn (Joel) Anderson of Ferryville, WI, Ruth (Greg) Zarling of Milwaukee, WI and David (Merideth) Sutton of Dousman, WI, her stepchildren, Dean (Janet Wagner) Hartley, Ronald (Julie) Hartley, Ann (Dan) Boland, Cathy (Todd) Aspenson and Joan (Steve) Pierce, her siblings, William (Joanne) Martin of Bagley, WI, Ray (Luella) and Mark (Barbara) Martin both of Eastman, Marcia Campbell of Springfield, VA, Elaine Magdalenski of Chelmsford, MA and Ed (Priscilla) Martin of Stoddard, WI, her sister-in-law Ellen Martin of Middleton, numerous grand and great grandchildren along with many nieces and nephews. She was preceded in death by her husbands, her parents, brother Leo Martin and an infant brother, James. A Mass of Christian Burial will be Tuesday, November 20, 2018 at 11:00 AM at St. Patrick’s Catholic Church in Seneca, WI with Rev. Samuel Martin celebrating and burial will be in the church cemetery. Friends may call on Monday, November 19, 2018 from 3:00 PM to 7:00 PM with a rosary at 4:00 PM, and one hour prior to the Mass on Tuesday at the church. In lieu of flowers, the family requests donations to be made to the Seneca Educational Foundation or St. Patrick’s Parish. The family would like to thank the staff at Maplewood Care Center in Viroqua.